As a freelance writer, I love doing what I do best: writing. But as a traveler and an adventure motorcyclist, I knew that I would have to start making videos sooner or later. In this day and age, where everything is visual and in real-time, it feels that either you make videos or disappear into obscurity. In this article, I’ll tell the story of how I produced my first videos for other bloggers looking to try out the video medium. Since I first started working as a newsroom reporter for a national newspaper in 2009, my primary focus had been the written word. As a reporter, I always had professional photographers accompany me whenever visuals were needed. Eventually, I switched to freelance writing so that I could travel more. In the last couple of years, I’ve noticed that editors increasingly wanted high resolution photos and/or video to accompany articles. My stories became less and less attractive to publications if I could not offer compelling visuals to go with them. I have been considering making my first YouTube videos to grow my skills as a contractor, but didn’t know where to start. A few weeks ago, I seized an unique opportunity to cover Rally Dakar 2019 for ADV Rider, an adventure motorcycle platform where I post most of my content. The legendary Paris–Dakar race is the toughest rally in the world; hundreds of car, truck, buggy, quad, and motorcycle pilots compete in ten or more grueling stages across the desert, navigating by roadbooks and camping in a different bivouac each night. Most of the time, only half of the competitors make it to the finish line. Held in Peru, this year’s Rally Dakar (the 41st) was expected to be the sandiest and most brutal of them all. Rally Dakar is religiously followed by millions of fans across the world. To best keep my audience in the loop, I knew that my coverage simply had to include video. As a blogger, I knew that video updates would be vital if I wanted to truly bring the audience closer to an unpredictable event like Dakar. The sights, sounds, personalities, and unplanned moments are better captured with video than with articles alone. I planned to chase the Rally on my Suzuki DR650, a dual sport motorcycle ready for both highways and off-road trails. My goal with the Dakar coverage was simple: to make my followers feel like they were chasing the rally with me. I wanted to show all – Riders leaving the bivouac; fueling up on liaison stages; desert starts and finishes; live updates from the bivouac and interviews with the pilots; the brutal dunes. I knew that if I could produce videos that reflected the insanity and suspense of the race then I would increase ADV’s social following and my own. After publishing the videos, I saw that my Instagram following increased by about 1,000 people, and ADV Rider YouTube channel went from 0 to 43 subscribers and an average of 300 views per video. While these aren’t impressive numbers, I’m excited about the results of this last-minute partnership. With better preparation and planning, I’m certain they would have increased even more. Here is what I’ve learned about creating video content during the Rally Dakar chase and why I recommend making videos ASAP regardless of what you do or what your brand is. Because my decision to chase the Dakar was very spontaneous, I had virtually no time to prepare. From the very get-go, it was simply a case of jumping on my bike and racing after the Dakar, creating content as I went along. Generally, I would film footage throughout the day from the bike and rest stations, narrating in real time what was going on and where I was. Then, I would combine my favorite parts of the video together at the end of the day. Often, that meant typing on my laptop or editing video footage at 2 AM in my tent at the rally bivouac, with engines and diesel generators roaring all around me and a 4am start looming. 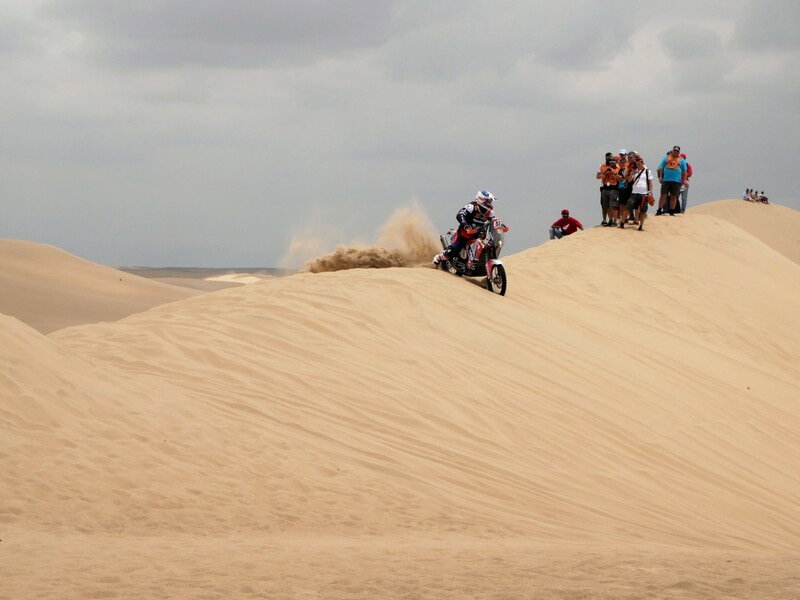 Other times, it meant doing live videos from gas stations, desert tracks, or time control waypoints as riders were just coming in after yet another grueling special stage in the Peruvian dunes. Because of these chaotic and often trying conditions, I needed video editing software that would let me instantly cut and split videos, quickly add a vignette and some music whenever necessary, use a filter here and there, and post. Since this was my first video making experience, I didn’t have the time or resources to invest in semi-professional video editors and spend countless hours on YouTube tutorials. I needed something basic, fast, and simple enough. All of the videos I made were less than four minutes long, but some were multi-clip videos that I edited together and others were <60 second single-clip updates. For longer videos, I used MovAvi, a video editor for PCs very similar to Apple’s iMovie. MovAvi is fairly cheap ($75/year) and it’s easy to understand and use. Most of the time, it would take me 10-15 minutes to cut the video, create a short vignette at the end using their templates, and export. Kapwing, an online video editor, is useful for adding subtitles and trimming down videos quickly as well as designing title slides and thumbnails. If I had a decent enough internet connection, Kapwing was a quick tool to edit my videos and post them online. For short video updates, I either did Facebook live or used the InShot video editing app on my phone. InShot worked wonders for me – it was very easy to use, had a few handy filters, and worked very quickly. Most of my InShot videos ended up on my IGTV and Facebook. Content–wise, I’m happy with most of the videos I did, but looking back, I see one crucial error that I will avoid from now on. Out of sheer excitement, I would sometimes forget that my viewers weren’t there with me and wouldn’t provide enough context or explain what was happening. This is reflected in the video view count: slightly longer videos where there’s more information, commentary, useful resources, or interviews all got over 300 views whereas the very short, flash 40-second updates generated very little interest. Takeaway: You may be chasing the most thrilling desert rally in the world, but if you can’t provide an interesting angle, breaking news, great conversations, or insightful information, your video just isn’t going to get views. Also, because the pace and intensity of the Dakar was so extreme, I only did minimal video descriptions and tags. That was a mistake. SEO is extremely important for videos, so for my future videos, I know I have to crack the tag and description code or else those videos simply won’t get found. I was posting different videos on the ADV Rider YouTube channel as well as my personal Facebook page and IGTV. On social media, I shared the emotional side of things whereas on ADV Rider, I focused more on rally news and competitors. The ADV Rider YouTube channel was brand new, with no existing audience. I simply posted as much as I could, and most of the viewers came from the blog entries on the webpage. For the short duration of the Rally Dakar, this worked well: my audience could enjoy longer written posts and images on the website, then visit the YouTube channel for video updates. Looking into the future, however, I plan to work on improving the channel’s exposure. My personal social platforms weren’t new, but the videos were a completely new addition, and again, I had no time to plan. As it was, I simply put out content as I went along without thinking about the format or branding. As soon as I get back on track, I know I have to work on these things to really up my video game on social. Regardless of the subject of your videos, whether it’s desert rallies, pet accessories, or fashion, great storytelling is key. No matter what you’re talking about, you need to make people care. Let your own voice and personality come through, and narrate or give commentary on the action that you’re recording. Post-production is important, and you should absolutely cut, subtitle, and edit your videos as best as you can. But if you are a beginner, don’t let it stop you! Nobody was born knowing how to edit video, so simply do it and you’ll learn as you go along. Online video editors are a great start! Content is more important than production. Even stunning, slick videos won’t get watched if the content is boring. Have a fantastic story, and it won’t matter that the video was made on your phone or with a low-resolution camera. (See YouTube advice from Kinga Tanajewska). Have a unique perspective. During the Dakar, instead of chasing the rally pros and superstars, I focused on the end of the pack: the rookies, the privateers, the independent riders. My audience loved this perspective. For one, these stories were much more relatable because people could see themselves in and relate to the novice, bootstrapping riders as opposed to factory-sponsored, high-earning celebrity racers. Also, the pros were covered by the best motorsports media teams, so, as a freelancer and rally newbie, I had no chance of competing with their resources, access and experience. Instead of trying to keep up with international press, I found compelling stories among the less known Dakar pilots. Prepare. Spontaneous bursts of ideas and content are great, but have at least a basic game plan before you jump in. What’s your story, your angle, your format and how frequently can you post? Figure this out before you begin. Do some prep work, like adding a cover photo to your YouTube channel, an intro video, and a YouTube and Instagram thumbnail. Practice making a few videos so that you can get the mechanics down. Strategize for exposure. How will your audience find your videos? Do you already have an established blog or social media presence? If not, can you guest-post? I was lucky to already have built a following on ADV Rider and my own social accounts, however small. Without it, I’m quite certain the videos would have gotten 10-15 views each at best, and soon forgotten. Get personal. Unless you’re a professional journalist, your stories can’t be impersonal. You need to be there, not just telling the narrative but also living it. Audiences love real emotions, struggles, challenges; vulnerability attracts. In my videos, I confess when I’m dog tired or that I lost the coordinates. I admin that I didn’t make it to a start line because I got stuck in the sand. I was honest about chasing and reporting on the Dakar as best as I could. And judging by all the messages and comments I got, it really resonated with people. Bottom line is, videos are taking over whether we like it or not. And sure, other formats are still valid. I still love writing, and I’ll be creating written content for as long as I can. But videos can add a fantastic spice, a new layer of depth in your work, and it’s definitely worth a try even if you’re only just beginning. Videos can really complement your storytelling in ways blogging never could, so roll up your sleeves, hit that record button, and go!